I don't usually do them first, but if I think they have a chance of being a yandere, in the overprotective nii-san or possessive/overprotective way, I'll save them and then squeal over them/how messed up it can get. Like Tei(and to a lesser extent Yeonho, but he was too clingy/childish for my taste) in Nameless, Toma, Shiki in Period Cube, of course, and Isora in 7'sCarlet, just for a few. Thankfully I usually have a pretty good yan radar. I love the mysterious and smart guys most; like kent or even Ikki(amnesia),Kono(tokimeki) or Ford (if you played story of seasons). At first i always chosed the uke (i don't know how else to describe it qx), the cute one. I can never get enough of tsundere or kuudere type characters (Okita, Takeru from CxM, Van Helsing, etc.). Although I have to admit I've found myself liking a lot of the sweet/funny/mysterious guys too (Lupin, Red, 707, Impey) that don't turn out to be from the yandere category. I actually don't mind yanderes that much, but it depends on who they are. 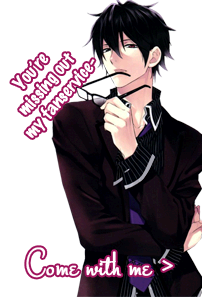 For instance I really liked Jumin's route in MM and Kuroyuki's in Nightshade, but could barely get through Yeohno's route in Nameless.